Sitting atop white clouds of snow at a respectable 1860m lies the ski resort of Alpe d’Huez, also known as l’ile au soleil, or the island in the sun, the nickname the resort has been given thanks to the 300 sunny days it receives on average per year. But what about the snow? Well worry not, as this beautiful site was specially chosen to host a purpose-built ski resort because it offers the ultimate winter sport combination of snowy nights and sunny days. The 250km of pistes extend across a terrain that tops out at a mighty 3330m on the Pic Blanc glacier, guaranteeing a snow-sure ski holiday, even if you may have to get up a little earlier for the spring skiing. Alpe d’Huez ski resort is a fantastic all-rounder with something for everyone; there are runs both on and off the piste to suit every taste and ability level, making it perfect for family ski holidays and mixed ability ski groups, while the fun and friendly atmosphere in the town centre appeals to all. Spread out over four separate quarters, Alpe d’Huez accommodation ranges from basic to luxurious but most offers good access to the pistes. There are also a host of options for non-skiers plus some sparkling choices for après-ski and late-night partying, and although slightly lacking in traditional Savoyard charm, you are more likely to meet a real French person here than in a lot of the bigger resorts more well-known to a British clientele. Snowboarder friendly – With 2 snow parks that offer an adrenaline filled day, boarders can try new tricks or even practice old tricks to their hearts content. Night skiing – Alpe d’Huez is one of the few resorts which offers a different side to skiing. Using a red graded piste on the signal mountain offers a new experience waiting to be tried. The longest black run in the world - With a distance of 17kms from top to bottom, The Sarenne has become a bucket list challenge for fearless intermediates and experienced skiers. Free to share this on social media, or embed on your website. If you use on your website please credit Skiworld with a link to this page. Alpe d’Huez skiing boasts an amazing variety of slopes over its 4 sectors and with 250km of pistes, some outstanding off-piste runs, a glacier and two snow parks, not to mention the longest black run in the Alps, there really is something for everyone. Ski Alpe d’Huez and the higher you go, the steeper it gets! Skiers will find the perfect mix of wide gentle greens towards the bottom of the mountain, challenging blues and reds in the middle and steep and demanding blacks at the top, although most corners of the domain are accessible on gentler pistes. The high altitude does mean that most runs are above the tree line, but all those bluebird days mean you won’t miss them too much. Advanced skiers may find the tough high runs closed when bad weather does arrive, but all will be forgiven when you get to carve up the Sarenne, the longest black piste in the Alps. Dropping the awesome 2210 vertical metres over 16km from the top of the Pic Blanc takes over an hour, it is one of the most advanced pisted runs in the world, but if it's speed that makes you freak, you may prefer to sample the sheer unpisted delights of the Tunnel – if you do, you know you are at the top of your game! Sector-wise, beginners and families will enjoy Vaujany’s cruisy and picturesque northwest facing blue and red runs. Intermediates should brave the vertigo-inspiring down and up Auris chairlift to sample the north-facing reds on the Auris side, whilst experts should find the yellow brick road over to the village of Oz to shred some excellent off-piste and tree runs. Boarders and park rats can get their kicks in the resort’s two snow parks, on the challenging boarder cross or dropping in on the natural half pipe, Le Couloir. Beginners will also want to make like the pros on the smaller kickers and rails in the beginner park just above the village. 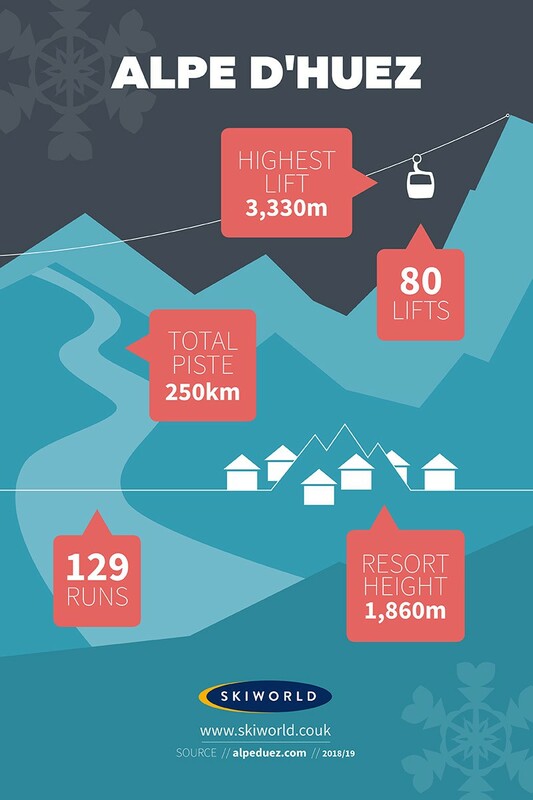 The Alpe d'Huez Grand Domaine Ski (full area) lift pass gives you unlimited access to the 84 ski lifts and 240km of piste within the Alpe d'Huez Grand Domaine Ski area. Family lift passes are available in Alpe D’huez and you can book them online up to 10 days in advance of your first days' skiing. One of the best things for those looking to ski Alpe d’Huez is the range of extra activities you can try. Swim, ice-skate, sledge, visit a museum, chill out at the relaxation centre or play ping-pong in one of the most comprehensive sports centres of any ski resort. What’s more, you can even hop on the shuttles between the different sectors so it’s easy to make the most of it all from any Alpe d’Huez chalet. Die-hard skiers can maximise their time on the slopes with a spot of night-skiing, practicing their turns in the Signal Slalom Stadium or once a month, tackling the 16km Sarenne run by the light of the moon (weather dependant). You can even take a day trip over to sister resort Les Deux Alpes to put a few more kilometres under your skis (just buy the bus ticket, or better yet, take a helicopter!). Adrenaline junkies won’t want to miss the huge ice-driving circuit and even culture vultures can amuse themselves with Alpe d’Huez’s architectural highlight – the local church’s surreal organ in the shape of a giant hand. Now that’s what we call an all-round resort! Anyone with an aversion to sleeping whilst skiing will also not be disappointed with the choice of nightlife on offer near their Alpe d’Huez accommodation. Dispersed throughout the village are an assortment of English, French and Scandinavian bars and we all know that makes for some very late nights. Choose from hanging with the locals in Freeride Cafe or go and see Julien for draught guiness, sports TV’s and his collection of gins in O’Sharkeys Irish Bar, jumping around to live music in your ski boots at Underground or spotting French celebs in the upmarket, cabaret style Sporting Bar. For those who don’t like to slip slide too far between their bars, the central hub of Smithy’s, Etalon, Lounge 21 and Igloo or Les Caves de l’Alpe clubs should not disappoint. If you’re not enjoying the ease of an Alpe d’Huez chalet holiday or are looking for somewhere good to eat on the host’s nights off, Alpe d’Huez offers a range of 60 restaurants, including many that depart from the usual tartiflette and raclette. Of course, if your ski holiday is not complete without eating your way through a half moon of cheese you will definitely want to sample the delights of Passe Montagne or the recently refurbished and re-opened Genepi restaurant in the old town for traditional cuisine or try the Altiport restaurant for spectacular views across the valley. For a spicy time, sample the English or Tex Mex delights of Smithys tavern in the old town, Lounge 21 for a steak or Le Tremplin close to the chalets de Bergers for a relaxed family friendly environment with a varied menu. When you ski Alpe d’Huez, you will find some amazing food being served up on the hill, with the futuristic Signal restaurant offering stunning views over towards Les Deux Alpes, while the Chantebise 2100 at the mid station of the main DMC lift offers something for everyone, as does La Taburle conveniently situated at the rond point des pistes where everyone can meet up, whether on foot or on skis. In a beautiful secluded location on the edge of a frozen lake lies the Chalet du Lac Besson or you can sample the fast food at the renowned Folie Douce or the upmarket Fruitiere restaurant attached to it.